CHICAGO (February 19, 2014) – Hyatt Hotels Corporation (NYSE: H) today announced that a Hyatt affiliate has entered into a contract with Jost Hurler Beteiligungs-und Verwaltungsgesellschaft mbH & Co. KG, a family-owned company based in Munich, for an Andaz hotel in Munich. The first Andaz-branded hotel in Germany, Andaz Munich will join hotels currently located in world-class cities including London, New York, Los Angeles, Shanghai, and soon, Tokyo. Expected to open in 2017, Andaz Munich will make its mark in the Bavarian capital, increasing the brand’s presence in Europe to three hotels. The 274-room hotel will be developed in central Munich in a cultural district known as Schwabinger Tor. 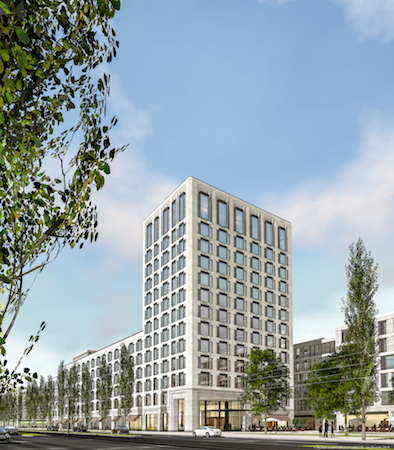 Situated between Leopoldstrasse and Berlinerstrasse, Andaz Munich will be part of a mixed use site, which will include newly constructed upscale residential apartments, retail shops, offices, theaters, and restaurants. Guests at Andaz Munich will experience the personal style, comfort and sophistication for which the brand is known in the hotel’s 234 guestrooms, 36 junior suites, three executive suites, and a presidential suite. The hotel will also feature an all-day dining restaurant, a lounge and rooftop bar, as well as an extensive fitness center with spa and pool facilities. Conference facilities will include a ballroom, seven conference rooms and pre-function space. Located in the heart of the city center, Andaz Munich will be near major tourist destinations such as Munchner Freiheit, the English Gardens, as well as the Parkstadt Schwabing business district. The location will also offers easy access to Munich’s inner ring road, and a direct connection to the A9 motorway, which leads to the Allianz Arena and the Munich Airport. Andaz Munich will collaborate with local artists, musicians, designers, and other cultural influencers to deliver events and programs on themes unique to its location in central Munich. The Andaz Salon, the brand’s signature cultural program, features interactive, on-property and virtual events conceived to support and nurture each hotel’s community of emerging talent. The distinctive spaces at Andaz Munich will stage creative Andaz Salon events, ranging from talks to exhibitions to live performances. These events can also be experienced through the Andaz Salon website at www.andazsalon.com, where unique content is shared by Cultural Insiders. Lessor is a family-owned private company based in Munich, and was founded in 1945. The founder, Mr. Jost Hurler, opened his first cash and carry outlet in central Munich and built a chain of wholesale and retail outlets, branded HUMA, throughout Germany. In early 1980, Hurler’s son and successor, along with the whole management team, died in a plane crash. From the mid 1980’s the company changed direction and became a property company selling the retail business and retaining the real estate. Today, the Lessor remains a property company owning some 13 mixed use developments throughout Germany and Austria. In addition, the Lessor owns the 180 room five-star resort at Lake Tegernsee in Germany. Global in scale while local in perspective, Hyatt’s Andaz brand delivers an innovative hospitality experience and attentive, unscripted service designed to accommodate guests’ personal preferences. Hotels in this collection reflect the unique cultural scene and spirit of the surrounding destination through their Andaz Salon events and are dedicated to creating natural and vibrant living spaces where travellers can indulge in their own personal sense of comfort and style. Eleven Andaz hotels are currently open: USA - Andaz 5th Avenue and Andaz Wall Street in New York, Andaz San Diego, Andaz West Hollywood, Andaz Napa, Andaz Savannah, and Andaz Maui at Wailea; Andaz Peninsula Papagayo, Andaz Liverpool Street London; Andaz Amsterdam Prinsengracht; and Andaz Shanghai. Andaz Tokyo Toranomon Hills is expected to open in mid-2014, marking a first for the brand in Japan. For more information, please visit www.andaz.com. Hyatt Hotels Corporation, headquartered in Chicago, is a leading global hospitality company with a proud heritage of making guests feel more than welcome. Thousands of members of the Hyatt family strive to make a difference in the lives of the guests they encounter every day by providing authentic hospitality. The Company's subsidiaries manage, franchise, own and develop hotels and resorts under the Hyatt®, Park Hyatt®, Andaz®, Grand Hyatt®, Hyatt Regency®, Hyatt Place®, Hyatt House®, Hyatt ZilaraTM, and Hyatt ZivaTM brand names and have locations on six continents. Hyatt Residential Group, Inc., a Hyatt Hotels Corporation subsidiary, develops, operates, markets or licenses Hyatt Residences® and Hyatt Residence Club®. As of December 31, 2013, the Company's worldwide portfolio consisted of 548 properties in 48 countries. For more information, please visit www.hyatt.com.